After picking up the Long Island City property for $173.5 million in 2016, the Durst Organization released this week the first rendering of its massive mixed-use building planned for 29-37 41st Avenue. Dubbed Queens Plaza Park, the 978,000-square-foot tower will hold 958 rental residences, as well as retail and office space. 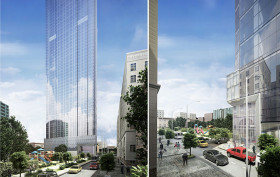 The rendering reveals a concave-shaped building which will wrap around the 90-year old landmarked Clock Tower, which is being saved and restored, as CityRealty reported. Back in 2015, Property Markets Group and the Hakim Organization announced plans to erect the tallest tower outside of Manhattan in Long Island City at 29-37 41st Avenue. The residential building, then dubbed Queens Plaza Park, would rise 914 feet atop a Queens Plaza site and boast high-end condos and a projected $363.2 million sellout. However, in July 2016, the developers abandoned those plans, putting the site up for sale for an undisclosed amount. Now, as the Times reports, the Durst Organization has scooped up the site for $173.5 million and is considering going forward with the massive construction, but as a rental tower with more than 1 million square feet. 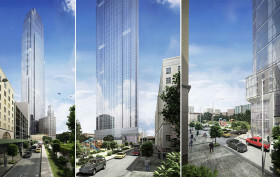 Just about a year ago, 6sqft revealed renderings for Queens Plaza Park, an 800-unit 70+ story, 915-foot tall skyscraper planned for Long Island City‘s Clock Tower Building site (it would’ve encircled and incorporated the 88-year-old structure). 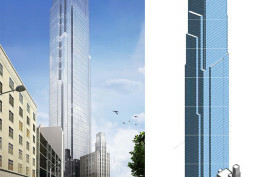 At the time, this proposed height would’ve made it the tallest tower in Queens, as well as the tallest building outside Manhattan. 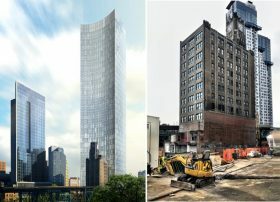 However, it’s now not only lost its superlatives (it’s since been outdone by the 964-foot Court Square City View Tower in LIC and JDS’ 1,066-foot 340 Flatbush Avenue Extension in Downtown Brooklyn), but the project is being scrapped altogether (h/t Curbed).